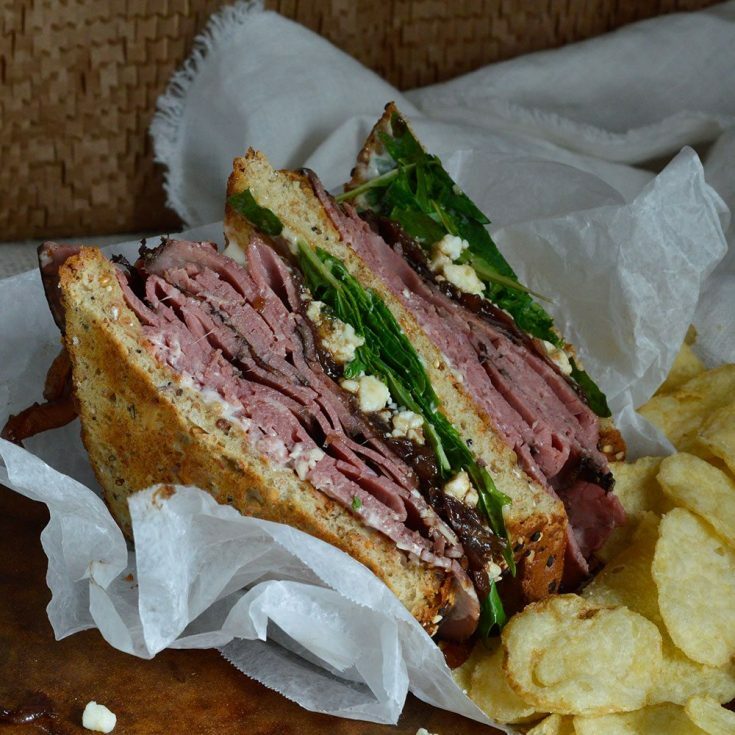 This Deli Style Roast Beef Sandwich is the best kind of lunch! Easy, delicious and flavorful. 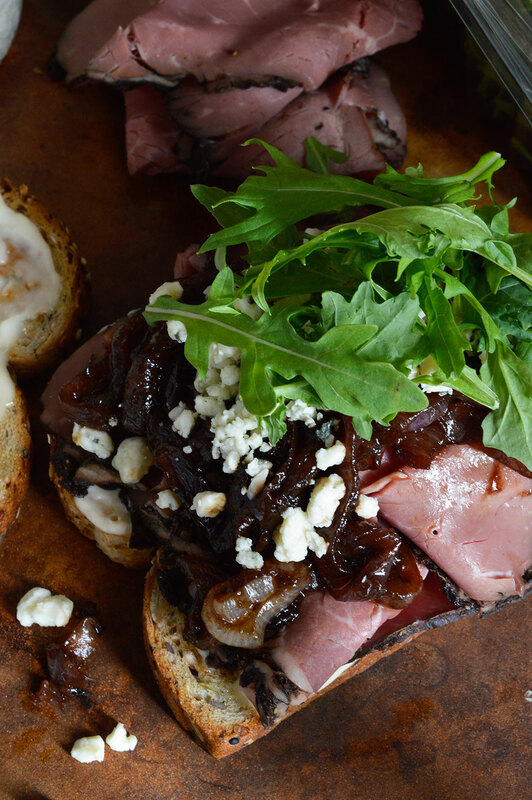 Deli roast beef, gorgonzola cheese, fresh greens and balsamic caramelized onions make this an amazing sandwich recipe! I am very serious when it comes to sandwiches. I could live on sandwiches. In fact, I did survive on sandwiches in my early 20’s. It surely beat the ramen noodle and day old pizza diet that most of my friends were on. When I was younger I was happy slapping some meat and cheese between two slices of bread. Maybe adding tomato slices if I was feeling fancy. This Deli Style Roast Beef Sandwich may just be the most delicious sandwich I have ever made! 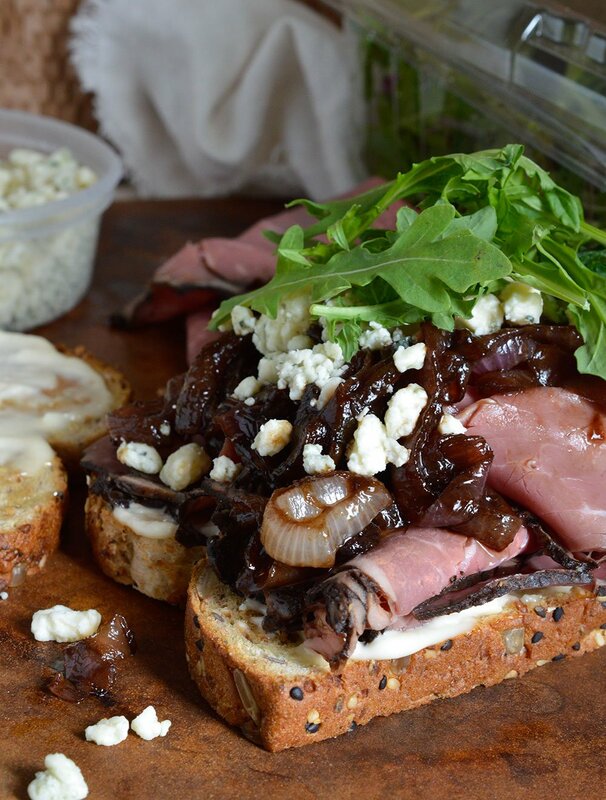 Deli roast beef, horseradish mayo, gorganzola cheese, balsamic caramelized onions and fresh Earthbound Farm greens tucked between two slices of seeded bread. 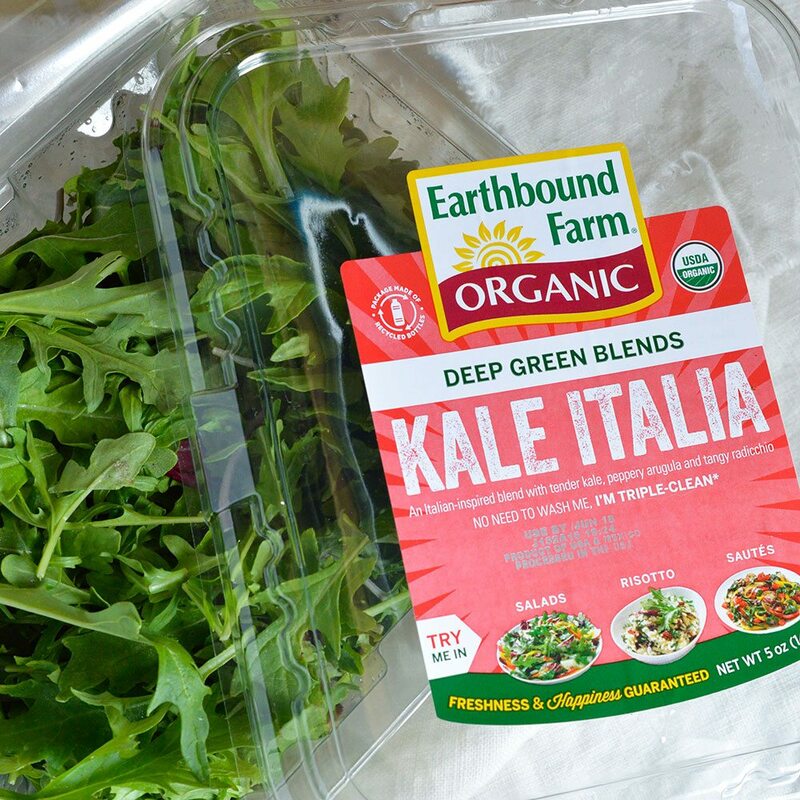 I used Earthbound Farm Kale Italia blend. With baby kale, tangy mizuna, arugula and radicchio; it adds the perfect peppery, fresh green flavor to brighten this sandwich. PRINT YOUR EARTHBOUND FARM COUPON NOW!!! Deli style sandwiches are the perfect summertime food. They don’t require a hot oven or grill. 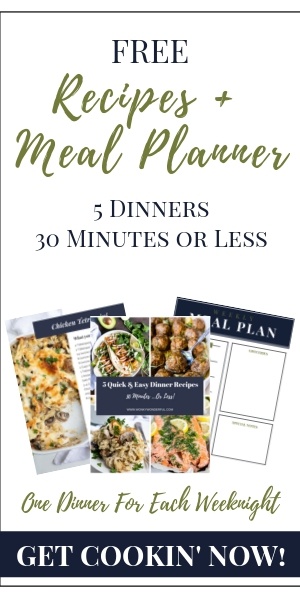 And you can have a full meal ready in minutes. Skip the traditional summer barbecues. Next time family and friends are coming over, surprise them with a Make Your Own Sandwich Station! Set out a variety of meats, cheese, bread, toppings and Earthbound Farm greens. Easy-Peasy! Trim the top and bottom from onion. Cut in half and remove skin. Slice onion from root to stem. Combine olive oil and onions in large saute pan over medium heat. Saute for 15 minutes while stirring frequently. Remove from heat and stir in salt and balsamic vinegar. Mix mayo and horseradish. Spread onto toasted bread. 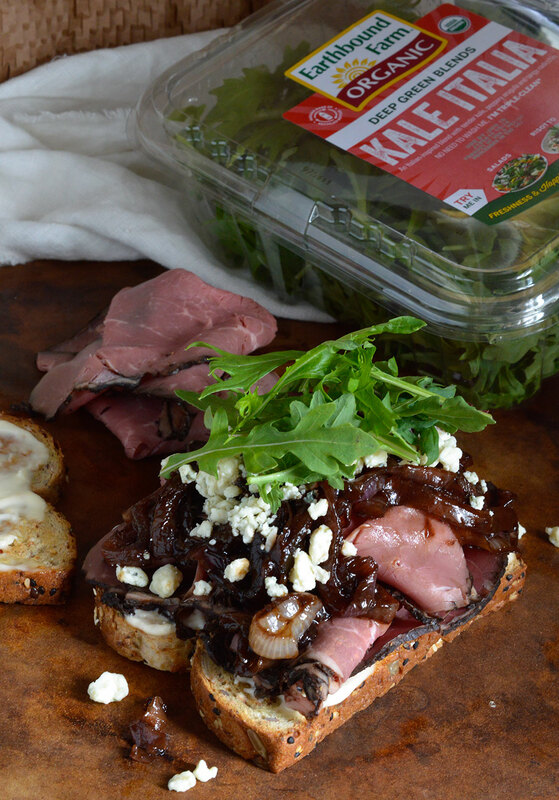 Layer each sandwich with 1/4 lb roast beef, balsamic onions, cheese crumbles and Kale Italia greens. 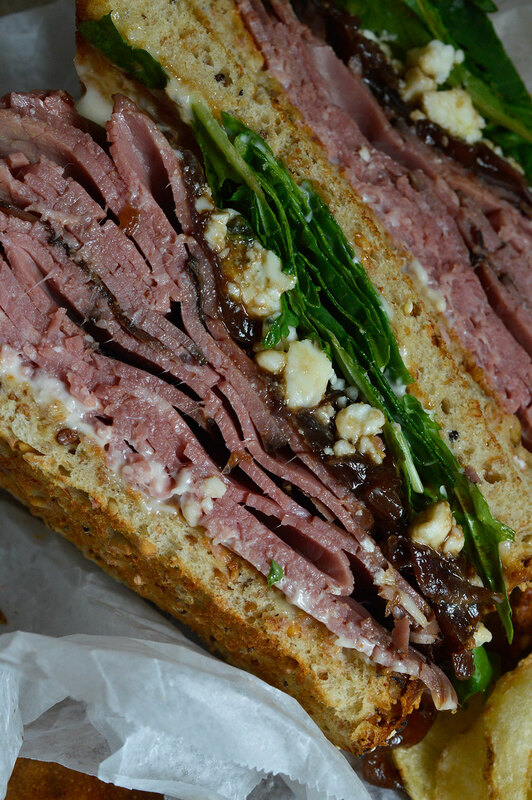 Some days, I just crave a good corned beef or roast beef deli sandwich. Thanks to this recipe, I can make an excellent one at home. This deli-style roast beef sandwich looks heavenly. I actually really like the idea of having a “make your own sandwich” station at our next get-together. I mean, who doesn’t like deli sandwiches? I could live on deli sandwiches!